Happy Earth Day! As this day stems from Arbor Day, I know many people try and plant trees or donate to causes that do the dirty work for them. If you are interested in planting a tree, check with your local town or county to see what public places are acceptable to be planting in. The last thing you want is for your goodwill to go to waste when you get in trouble for digging in the wrong places. Trees have incredible benefits. Most prominently, they filter our air for us, providing us with the fresh air we breathe. They offer shade, some offer fruit, but more than that, they increase our happiness. Trees can increase the value of your neighborhood and some even believe that they reduce crime. 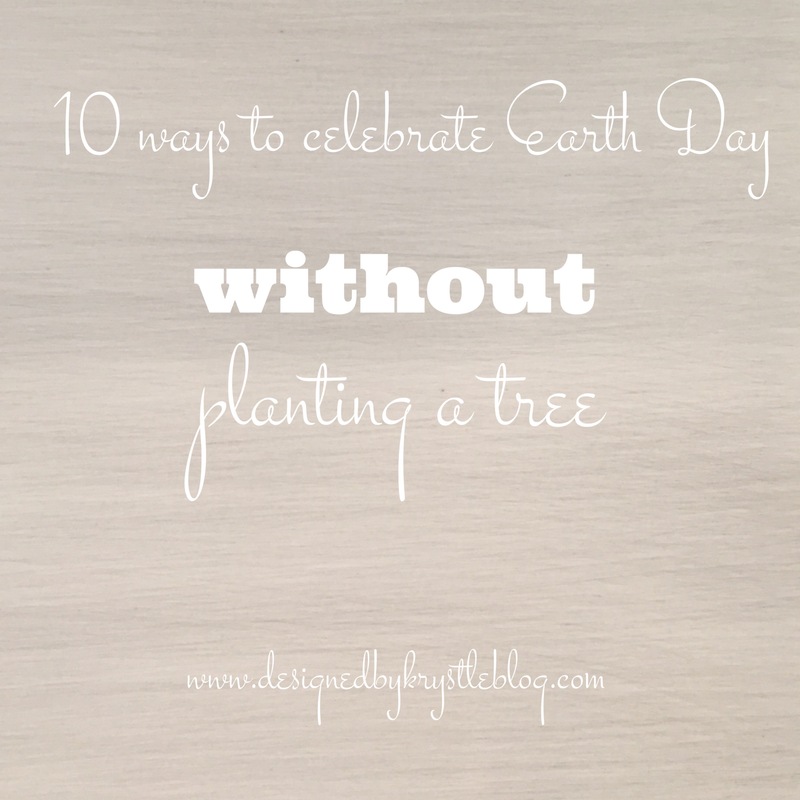 If you are unable to plant a tree today in honor of Mother Nature, there is still plenty you can do today (and everyday) that will have a positive effect. Here is a list of 10 things you can do, try and check a few off your list this week, and see if there are some that you can squeeze into your day-to-day life as well. Start a compost bin. It will make great soil for planting in your garden while cutting down on waste. Shop the farmer’s markets. Keep it local and fresh by stocking up on produce from the local farmer’s market, this can also reduce toxins if they aren’t using pesticides when growing as well. Spend the money on re-usable shopping bags. Do yourself a favor, and make a habit to always keep two in your car. You can also create a habit of getting the old bags back into your car by putting them on top of your purse once they are unloaded or put them on a hook by the door, or even just looping them over the door-knob. These are some foolproof ways to make sure you always have them. Use them for more than just groceries, use them for clothing, the drug store, etc., there is no limit to where they can go, just more limiting of paper and plastic bags being used. Switch to cloth hand towels in the bathroom and kitchen. I know some people find this to be a dirtier, more germ-infested way, however, if you consider using one to dry your clean hands on in each room that can be re-used multiple times a day over the course of a few days as opposed to one disposable towel that is used once and tossed. Also for clean dishes, dry them with a fresh kitchen towel, this as well as the hand-towels can be washed and re-used over and over again, and save a lot of paper. There are times when a paper towel still might be preferable, and in that case, or in the case of toilet paper, recycle the inner cardboard tube instead of throwing it away. Group your errands by location. Throughout the week there are things that need to get done. Try making a list of what you need and grouping things that are located in the same neighborhood on the same day to reduce driving back and forth to all the places everyday. Go to the car wash. Using a car wash (do your research to find a reputable one in your neighborhood) ensures that the waste water is not running off into the general waterways. Transition your cleaning supplies over to an eco-friendly variety. There are plenty of green cleaners available at the store, but there are also some you can make using general household items. Replace your light bulbs. Start the process of keeping CFLs or something more efficient on hand and when your current bulbs burn out, replace them with the more efficient variety. When you aren’t using something, turn it off and unplug it. Try not to let the auto off settings do the work for you because things will stay on so much longer than necessary. So when you are finished making your coffee for the day, turn off the pot; done fixing your hair, turn off the blow dryer, flat iron, etc., turn them off and put them away; finished watching TV, turn it off. Most small household appliances have an sensor in them to automatically turn them off after a period of inactivity, but it would save so much if we just flipped the switch ourselves when we were done. There is a list for you of simple tasks and tips that you can start implementing today! What else are you doing to be more ‘green’ or how are you celebrating this Earth day? I’m curious to know what I’m missing out on, so leave your comments on what else can be done. I hope you are enjoying this series! I have some prettier posts planned for the rest of the week on how you can be more green in your design process to round off this mini-series. If you’ve made it through these wordier posts, I appreciate it, and if you are starting to implement some of the things we’ve been discussing, I know that the earth is thankful too.